Digital boards inside the General Assembly display the votes cast by Member States on a draft resolution on Syria. The General Assembly today strongly condemned the continued “widespread and systematic” human rights violations by the Syrian authorities and demanded that the Government immediately cease all violence and protect its people. The 193-member body adopted a resolution backing Arab League efforts to resolve the crisis in Syria, where UN officials estimate that security forces have killed well over 5,400 people since the popular uprising began last March. Thousands of people are also believed to be missing, some 70,000 people are internally displaced and 25,000 have fled the country to avoid the violence. The resolution strongly condemned the continued “widespread and systematic violations of human rights and fundamental freedoms by the Syrian authorities,” such as the use of force against civilians, arbitrary executions, the killing and persecution of protesters, human rights defenders and journalists, arbitrary detention, enforced disappearances, interference with access to medical treatment, torture, sexual violence and ill-treatment, including against children. The adoption of the resolution was welcomed this evening by General Assembly President Nassir Abdulaziz Al-Nasser and Secretary-General Ban Ki-moon, who both issued statements through their spokespersons. He called on “all peace-loving nations to continue to support efforts aimed at finding an urgent solution to the crisis in Syria, including plans to host a conference in Tunisia [scheduled for 24 February] involving countries in the group of friends of Syria. Speaking before the vote in the Assembly, Ambassador Bashar Ja’afari of Syria called the draft a “biased” text that has nothing to do with the situation in his country. He cited several developments that respond to popular demands, including the referendum set for 26 February on a new constitution and the intention to hold a national dialogue. No country can allow the presence of armed terrorist groups on its territory, he stated, adding that he had “deep concerns” vis-à-vis the real intentions of the countries that have co-sponsored the text. He called on these countries to stop interfering in internal Syrian affairs and stop adding fuel to the fire of the tensions in his country. Today’s action follows the recent failure by the Security Council to agree on collective action on the issue after Russia and China vetoed a draft resolution endorsing Arab League efforts to end the crisis. It also follows a debate in the Assembly on Monday during which the UN human rights chief appealed to Member States to act now to protect the Syrian people as the Government’s violent crackdown on peaceful protests continues unabated and the number of dead and injured continues to rise. 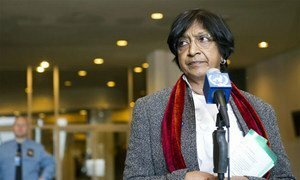 “The longer the international community fails to take action, the more the civilian population will suffer from countless atrocities committed against them,” High Commissioner for Human Rights Navi Pillay told the Assembly. Earlier today, in Vienna, Mr. Ban discussed the situation in Syria during bilateral meetings with key international officials, including French Foreign Minister Alain Juppé, Russian Foreign Minister Sergey Lavrov and Austria’s Foreign Minister Michael Spindelegger. The UN human rights chief today appealed to Member States to act now to protect Syrians as the Government’s violent crackdown on peaceful protests continues unabated and the number of dead and injured continues to rise.